The ECBA exam simulator is a simulated ECBA practice tests platform. 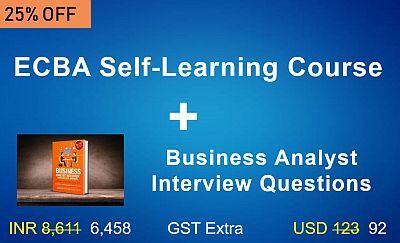 These ECBA exam questions are based on IIBA BABOK guide version 3. You can practice with knowledge area wise tests. Once you feel confident, then you can take up full length ECBA tests for maximum benefit. The ECBA question bank used for this simulator is fairly large and calibrated well for a first attempt success. As per IIBA website, ECBA exam questions are not evenly distributed across the knowledg areas. 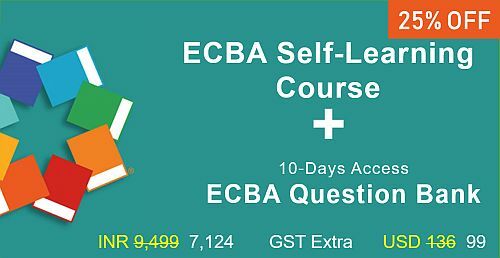 This ECBA question bank is based on BABOK v3 and is aligned with ECBA v3 exam pattern. 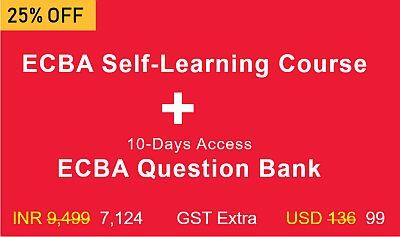 This question bank is designed by ECBA v3 certified professionals. This ECBA exam simulator comes with multiple useful features to assist you in your exam preparation endeavor. Is ECBA Certification meant for beginners? ECBA Certification exam is a multiple choice questions (MCQ) test. The duration of the ECBA™ exam is 1.5 hours. The exam consists of 50 multiple choice questions. There is no negative marking so you must try all the questions. What is ECBA Certification exam cost? ECBA Certification exam fees is USD 295 (USD 60 as application fee and USD 235 as exam fee), if you are not an IIBA member. IIBA members have to pay USD 170 (USD 60 as application fee and USD 110 as exam fee). IIBA membership fees depends on the region. India comes under region 3 and the membership fees is USD 55. United States of America is in region 1 and the membership fees is USD 125. You can take this test anywhere and don’t need to go to any centre. These exams are conducted by PSI.